The Rider honing guide is very similar in design to the classic Eclipse 36. It is an ideal tool for achieving a consistent bevel angle, everytime you sharpen a blade. 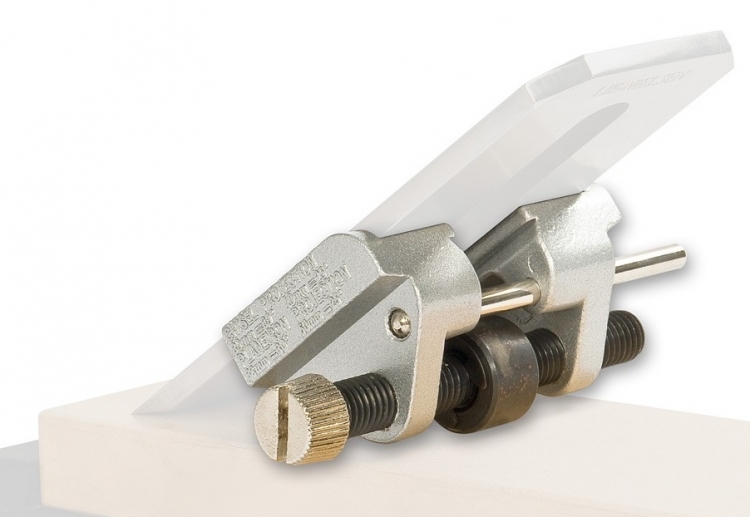 The guide offers two tool-clamping positions. The upper jaw accommodates blades up to 78mm(3-1/8") wide. A lower V-groove secures bevel edge chisels or thin tools from 3mm(1/8") to 48mm(1-7⁄8") wide. The bevel angle depends on the blade's projection in front of the guide. Typically, plane irons in the upper jaw: 50mm(2") gives 25° and 38mm(1-1/2") gives 30°. Chisels or blades placed between the lower jaws: 40mm(1-9/16") for 25° or 30mm(1-3/16") for 30°. We recommend constructing a very simple jig to make setting quick and simple. Using a jig will guarantee consistent bevel angles everytime you sharpen. The guide’s 19mm(3/4") diameter by 12mm(1/2") wide roller allows you to hone both straight cutting edges or, by slightly rocking the guide, put a crown on an edge.